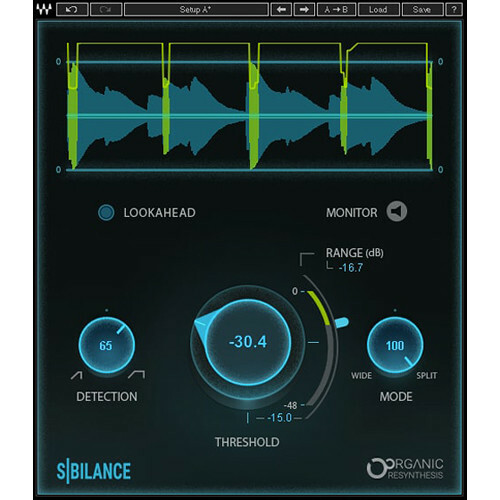 Available for download, Waves Sibilance is a de-esser that makes use of Waves Organic ReSynthesis technology to result in glitch-free processing of sibilated sounds. Use this plug-in to reduce the harsh noise from s and sh consonants in sung and spoken vocals, doing so in a way that doesn't alter the vocal's inherent tonality. With this plug-in, you'll be able to secure a brighter overall tone without the harshness commonly associated with sibilance. Threshold and Range controls function as you'd expect, setting the level at which processing begins and the maximum amount of gain-reduction respectively. Conventional Lookahead and Monitor controls are also on hand. Instead of a frequency control, you're provided with the Detection Width knob. This control, located on the left of the GUI, intelligently focuses on sibilance. At lower values, it detects narrower frequency ranges, while higher values result in wider frequency ranges. Use the lower settings to isolate the s and higher-settings to find sh sounds. Traditional de-essers often let you select between wide and split-band processing. The Sibilance's Mode control, however, lets you transition gradually between the two. Lower values will affect the full frequency range, while the highest value targets frequencies above 4 kHz. You can blend between the two poles or automate the Mode control to target different types of sibilance at different parts of the tune. This plug-in works in mono and stereo applications. Included are modules for mono/stereo live use as well, but these modules don't sport lookahead controls. Sibilance is compatible with Mac and Windows platforms, and can operate in AU, VST, and AAX formats.